Manco specializes in helping municipalities, equipment OEMs, and industrial clients manage their water & wastewater treatment plants in a safe and cost-effective manner. Manco has a deep understanding of automation systems in water and wastewater applications that has been hard-earned through years of industry experience. This gives us an advantage when it comes to designing and implementing complex control systems. Manco specializes in working with municipalities, equipment OEMs, and industrial clients manage their water & wastewater treatment plants in a safe and cost-effective manner. We work in new plant construction as well as control system retrofits of obsolete existing systems. Our skilled team of programmers are factory trained from the leading manufacturers of PLC’s, HMI and SCADA system software. 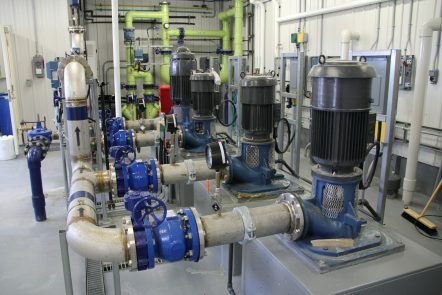 We have extensive experience in integrating multiplatform systems that monitor and control pumps, aerators, clarifiers, filters, tank levels, chemical feed systems, dewatering systems and distribution systems. From drinking water automation to wastewater treatment, we understand the economic, regulatory and technical demands that affect the water & wastewater industries. Manco extensive experience within this market provide us with substantial expertise in product selection and application, design, project management, system start-up, and training. Manco is an authorized distributor of a wide range of innovative Delco Water Products. Please see Delco Water Products for more information. © 2016 Manco Control Systems Inc. All Rights Reserved.